I thought long and hard about writing this post. I'm still debating whether it's even a good idea. A part of me feels like I need to do this, I need to tell my story and then finally I will be able to move on. At the same time however, I don't think I'll ever be able to. I'm sure you are all aware of the #MeToo movement that's been happening for the past few weeks. I am so incredibly moved by all the women, and men, who have come out and told their story. Whether something happened years ago, or a few days ago, the bravery of those people is immense and has, in a way, pushed me to do this. I've also become a person I don't recognise, and although I fight this everyday, although I try to work through this everyday, I have pushed a few people away from me because of that. Two of whom I cared for and loved very much, but because of my actions and this change in me, I have now lost forever. And quite frankly, I am done letting this define me, because the past 10 months of my life have been hell enough. Prior to this year, I remember hearing stories of assault and being very sure of what I would do if I was ever in that position. Never did I imagine that I actually would be, and that the image I had of myself of a strong, hard-headed woman would crumble down. At the beginning of this year, I was raped. And it was done by someone I knew. Someone I would then have to see five days a week for five, six months. I think this is partially why I didn't know how to deal with this, because I couldn't get out of the situation I was in. This has also played a big part in me moving out of Norwich and dropping out of UEA, as I couldn't stand to sleep in the same bedroom and walk through the same streets every day.I needed a change. I'm about 90% sure this happened at the end of February, but my timeline from February and March has been very blurred and I can't pin point it exactly. I really wish I could. It was a night of a work do. A few friends came over to mine, we pre'ed, we got ready, we headed out to the bar. The guy in question was already there. He bought me a few drinks, but I didn't think much of it, as I was sure we were doing rounds and I bought drinks for him, too. He kept touching me but I kept brushing him off. As a group, after a few hours we decided we were bored and wanted to change venue. We were having a chat outside, I can't remember what about, and one of my other friends jokingly kissed me, we laughed. However, straight after that he grabbed me, and kissed me, too. I was in too much of a shock to say anything so I just stood there with a confused face and decided he's just drunk. For some reason or another, we couldn't find a bar we liked, so we decided to all head back to mine to chill out, drink some more and watch a film. A few people started doing drugs. Once we got to mine, I was offered some, and thought 'hey, what's the worst that can happen? I'm at my own house'. One thing I learned that night is that my body doesn't like drugs, as I almost immediately threw them all up. I then decided I was too tired, and wanted to go to bed, leaving my guests downstairs so they could crash. Or so I thought. I got upstairs and realised he had followed me. Still though, I wasn't thinking anything of it, as there wasn't much space downstairs, so I thought he could just sleep on my floor. But he got in my bed. And yet still, I thought he was just drunk and wanted to sleep comfortably. I was wrong. I said 'no'. I said 'stop'. I said 'I don't want to'. I don't know how long it lasted, but I did eventually manage to push him off. And then he fell asleep, whilst I lay there unable to move. The next morning, one of the guys made a joke about us sleeping together, once the other guy left. I said that it wasn't like that and that I wasn't happy with the situation. I didn't really expand on it. But I kept thinking about it. Did I really say 'no'? Did I really ask him to stop? Did I imagine the whole thing? Did I lead him on? Was this all my fault? Maybe he just didn't hear me. I left it at that, but the joke was brought up again a few days later within a small group of work friends. I wanted to talk about it, because I didn't want people thinking we had slept together. I again said that it wasn't what I wanted, and I told them that I kept rethinking the night. At that point, the only other girl in the conversation turned around and said to me "You shouldn't be talking about this. He's a good guy and you could ruin his reputation". And if there's one thing that one girl can say to another to shut her up, it's just that. So I did stop talking about it, until a few weeks ago. I met someone at uni, and somehow one of our conversations had ended up on this topic. I started to open up a little bit, and she helped me realise that I should've never let anyone silence me. If she's reading this, and I'm sure quite sure she is, I would just like to thank her. Because the last month and a half has been a little easier. Another friend whom I told said to me "I'm sorry this has happened to you" and I replied saying that it's okay. But it's clearly not okay? It's not something that should ever, ever be okay. I still haven't reported it. I still haven't spoken to him about it. I don't know if I ever will. I know I should, because I worry it might happen again. But there's still parts of me that blame myself. I can't believe that I'm victim blaming myself, but I am. And I sometimes justify his actions. Or try to excuse them. And I think about what happened every single day, without fail. There are days when I'm embarrassed that I let this happen to me. I feel wrong in my own body, like it doesn't belong to me. I think what I'm currently feeling the most though, is anger. I'm angry at what has happened to me, I'm angry about how it changed me and I'm angry about how it has made me behave. I have lost all trust for people, especially men. Because I have kept it in, my anger has been projected on the men closest to me, and that isn't fair, but it is the only way I've been able to cope with it for the past few months. Although I never want this to be an excuse for anything, I never want it to define me, either. I sometimes feel like I need to defend myself, and explain myself, because who I've been for the last 10 months isn't who I am as a person, and somebody else's violation of my body and trust shouldn't be the person that others see me as now. Although I've said that I have awful days still, I'm also learning how to get better and how to move on. Maybe it'll take a few more months, or a few more years, or maybe this will be with me for the rest of my life. I don't know the answer to that. What I do know though, is that no one, man or woman, should ever have to go through anything like this, and I will do whatever I can to help others get through this, because no one should be silenced. Hello my loves! Long time no post (although, in my case, pretty good going...). 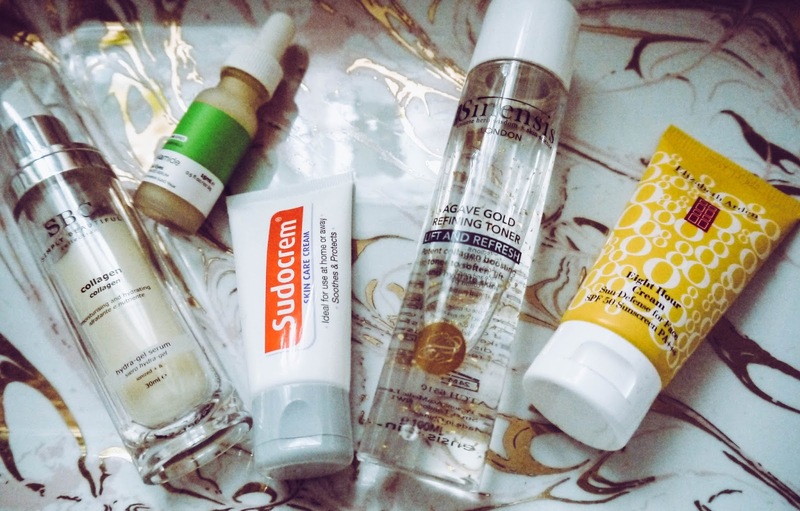 I thought I'd write a little bit about my current skincare routine. It's not perfect, and I am looking to change a few things, purely because I think my skin has gotten used to some of these products. They're nonetheless. I'll kick it off with the classic favourites. 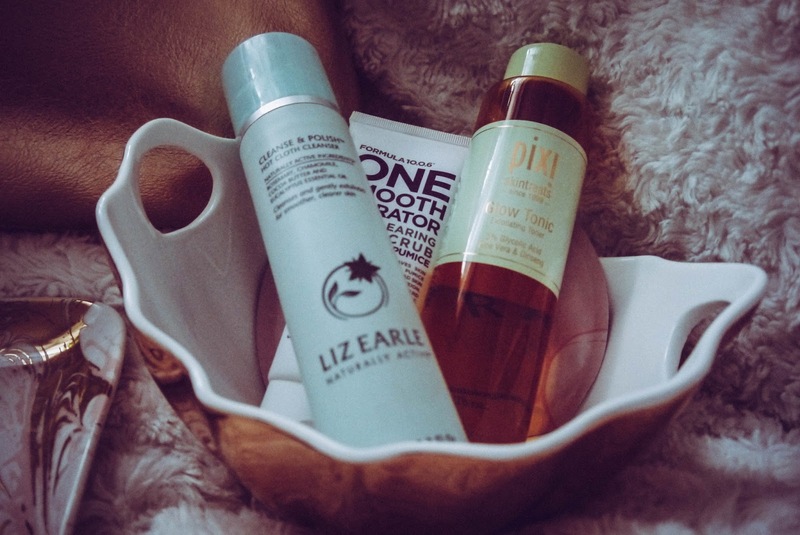 Liz Earl Cleanse and Polish and Pixi Glow Tonic. I've been using Cleanse and Polish for about two years now, and I do genuinely think it's played a major role in clearing up my skin. I usually use it twice, first to take off my make up and then to cleanse my skin. I follow that with the Glow Tonic, and I'm convinced this stuff is magic. Every time my skin feels dry, or bumpy or I'm breaking out, this just works. Every single time. I know everybody recommends these products, but I honestly believe they're worth the hype. When my skin needs exfoliation (which lately is quite often), I've been reaching for the Formula 10.0.6 One Smooth Operator. I'm never quite sure what I need to look out for in a scrub, but I feel like this does it's job. Once I've done the above three steps, I go in with the SBC Collagen Hydra-Gel*. It's a rich and intensive water-based serum, which helps to re-hydrate, plump the skin and reduce the appearance of fine lines. I know I'm only 23, but this is the time to start slowing down the signs of ageing! Also, collagen is just really good for your skin. I then reach for Hylamide Subq Eyes. I've always found that my eyes were my problem area. I've got very dark circles, and my skin is always puffy and very dehydrated around them. And again, eyes show the first signs of ageing. I haven't been using it for that long, but I did a little research and found Caroline Hirons' post about this, so decided to give it a go. So far, so good. As my skin has been soooo dry and flakey recently, I've been treating it to an overnight Sudocrem* mask. Even as a mask, a little goes a long way. I've only been using this on my face for about two, three weeks now, but I can already notice the difference. I normally use it on spots anyway, and sometimes as a hand cream. I've also been using it as a primer, and I find it works great, too. Perhaps slightly better than my Smashbox one... I'd definitely recommend picking this up to try out if you haven't, and the Skin Care cream is only £1.99 at Boots, so I feel like you can't really go wrong here. When I feel like being fancy, I use the Sinensis Agave Gold Refining Toner*, instead of Pixi Glow. This again is very high in collagen (a favourite of mine if you cant't tell) and it's rich in Vitamin C. I don't reach for this enough to have a detailed opinion on it, but it does make me feel very extra when I do use it, and if you're about that life too, I'd recommend checking it out. Applying SPF regularly is something I must admit I'm not that great at, but I've picked myself up the Elizabeth Arden Eight Hour Cream Sun Defence SPF 50 Sunscreen (what a mouthful eh). I got this in TK Maxx, so I didn't pay the full price for it. I know it's important to apply it, even when it doesn't seem that sunny outside, especially since I have very sensitive skin and I do burn very easily (I look more like a lobster roll rather than a bronze goddess) so I should definitely pay more attention to it. I thought I'd wrap this up by mention my two favourite masks. 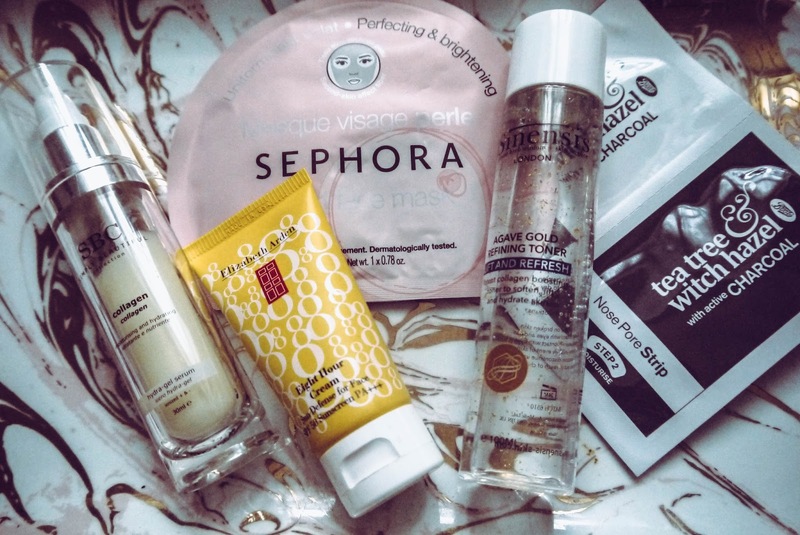 First one is the Sephora Pearl Sheet Mask. I'm pretty sure I've tried all of their sheet masks at this point, but I definitely think this is their best one, as it smells great and I do genuinely think my skin looks a little brighter after using it. Second are the Boots Tea Tree and Witch Hazel Nose Pore Strips (not technically a mask, I know). I personally think these work better than the Biore ones, I think it might be because it's a two step process, and my nose always feel extra smooth after Step 2. In 2018, I want to get more into skincare, I've also mentioned that in my previous post. I've already started researching Korean 10 Step Regime, and I think I'll be jumping onto the bandwagon. Have you got any skincare tips, or products that you definitely recommend?